Ratatouille (Not the Movie) | Jake & Sam -- Let's Cook! There are a zillion recipes out there for ratatouille, right? Everyone from Julia Child to Martha Stewart has a version. So why am I bothering with it it when I usually only write about dishes you’re not likely to run into or ones that I have a strong opinion about the right way to make it? Check the latter. Ratatouille is one of the most abused dishes in the universe. It seems you can just bung a pile of veggies into a pot with some olive oil and garlic and 15 minutes later, voila, ratatouille! It’s not a complicated dish but it does require some care. I think it’s important to cook the vegetables separately before combining them, allowing each one to maintain its individuality, so that you don’t end up with a sludgy mound of undercooked eggplant and overcooked zucchini. With its olive oil, garlic, peppers, onions, tomatoes, eggplant, zucchini and herbs, ratatouille is about as Provençal as you can get. You can make it year ’round but it’s at its best in the summer when the veggies are at their peak. Not only is it delicious but it’s high in nutrients and low in calories, making it super healthy. I like to serve it on its own, warm or at room temperature, where its flavors can best be appreciated, but it is also good hot with roasts or grilled meat. As it does take a bit of effort, I usually make a fairly large amount so that by the end of a week we never want to see ratatouille again. Cut the eggplant and the zucchini into 1/2 inch cubes. (If the zucchini are less than 4″ long, cut them into rounds.) Put them separately into colanders, salt them with a teaspoon of salt each, weigh them down with something heavy, and let them drain for at least 30 minutes. Pat dry on paper towels. I don’t like to saute eggplant because it absorbs too much oil. So I line an oven tray with foil, and toss the eggplant and zucchini separately, each with a tablespoon of olive oil. If your tray is big enough, spread the veggies out separately on the tray – otherwise use two trays. Heat the oven to broil and broil the eggplant/zucchini for about 10 minutes until beginning to brown. Turn them over and bake for a further 5 minutes, until soft and lightly browned. Ovens and grills vary widely so keep a close watch and do not burn. While the eggplant and zucchini are draining and cooking, saute the onion in two tablespoons olive oil until softened, about 10 minutes. Add the peppers and cook for another 10 minutes. Add 3/4 of the tomatoes, the garlic, thyme and optional bay leaf, salt and pepper, and simmer over low heat until the peppers are cooked and the liquid in the pan is reduced somewhat. 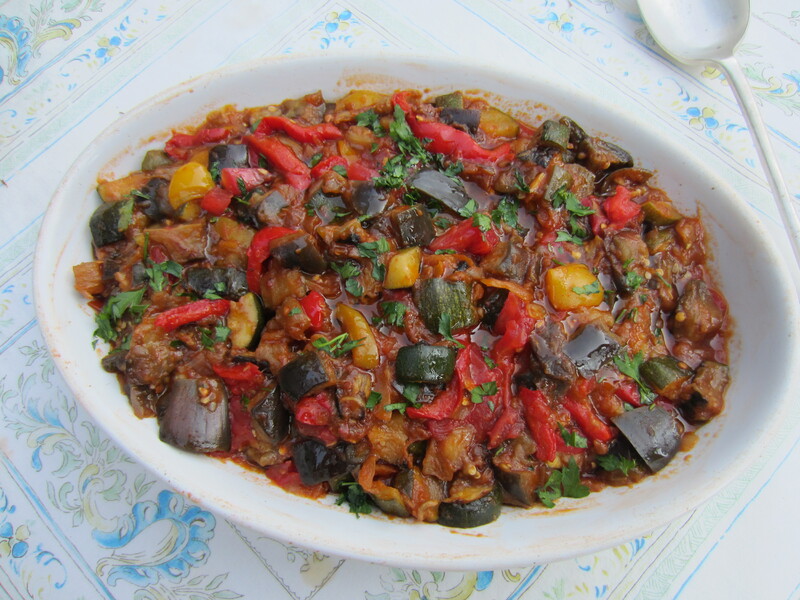 Add the eggplant and zucchini and continue to cook over low heat until you are satisfied with its texture. I like it well cooked so let the combined mixture simmer gently for up to half an hour. I also like to add the remaining tomato towards the end, especially if the mixture is beginning to stick, but also to give it a jolt of fresh tomato flavor. This is of course optional. Turn the ratatouille into a large serving bowl, check for seasoning, add the chopped parsley and torn basil leaves and a splash of olive oil. Covered, it can last in the refrigerator for up to a week and is actually better on the second and third days. For something different, spread leftover ratatouille in a gratin dish, heat it and make indentations in its surface to accommodate as many eggs as you wish to serve. Carefully break an egg into each indentation, return it to the oven at 350 degrees until the eggs are just set, about 10 minutes.